It took almost exactly 48 hours, but tonight I’m in Natal, Brazil, in a shabby but nowhere near worst hotel I’ve ever stayed in, ready for my World Cup experience. My son and I walked out the front door in Bangkok at 1030pm Friday night. We sidled up to the counter of our Natal hotel at the equivalent of 1038pm Bangkok Sunday night. Are we tired? Well Callum has slept through two and a half football matches, an NBA match, and dinner. And is still a long, long way from waking up! But teenagers need a lot of sleep. It seems. I, on the other hand, after nine years of breakfast radio, am all over the shop. The excitement of actually being in Brazil for a World Cup is pretty intense, but yep, I feel pretty tired. Got to see first hand today why so many Brazilians are really not in World Cup party mood.. We teamed up with four Americans to hire a driver to take us from Recife to Natal, a pretty important and busy 300km route in the northeast corner of Brazil. The road was, in parts, atrocious for a major intercity route. In some parts our driver, who was seriously as mad as a sack of ferrets, had to slow down from his preferred speed of 163kph to about 5kph to avoid totalling his car. And his newly arrived passengers. Many Brazilians are asking how their Government can spend $11b on a football tournament when so many people are living in poverty and there are crumbling roads and schools? But I’ve also already seen why countries like hosting these sorts of events and the benefits they bring. Last night, during a six-hour stopover at São Paulo Airport, we joined dozens of football fans from every corner of the world sprawled on beanbags watching Italy beat England in a cracking football match. When one poor unfortunate in one of the front beanbags stood up at an inopportune time he was whistled at in three different tones and reminded in at least six different languages that he was in a room full of jet-lagged football fanatics. Sitting near me were fans from Nigeria, Iran and Algeria. None of us spoke a shared language, but when Wayne Rooney started spraying the ball with reckless abandon we each knew what the other was saying – dummkopf! 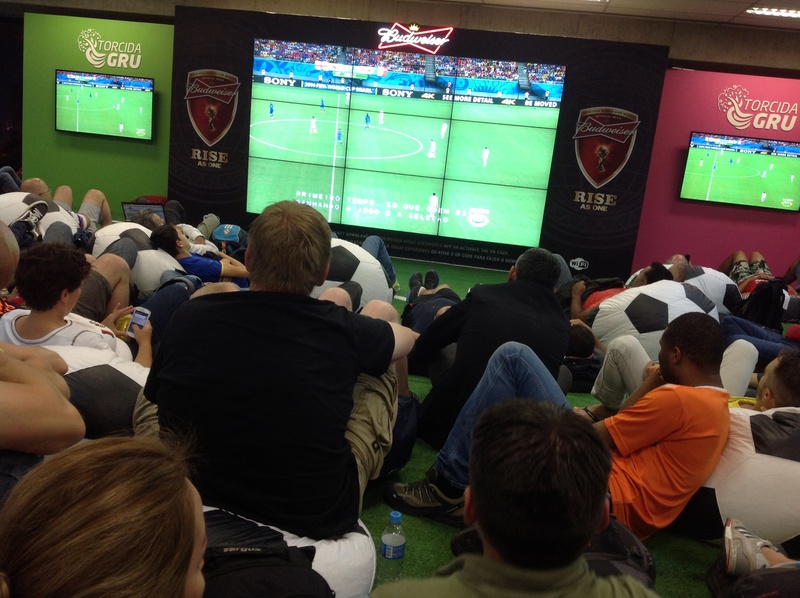 Tomorrow the real stuff begins – USA v Ghana.. Natal is crawling with Americans. Our travel companions told us more American fans have travelled to Brazil than fans from any other country. I’m not sure that’s right, but for the sake of harmony in a sardine-can travelling at 163kph down a barely bituminised bitumen road it didn’t seem right to quarrel. Even they had been travelling for more than 24 hours, and they’d only come from just up the road. But they were happy, because they’re expecting a win tomorrow. I’m not so sure. We’ll be seeing Ghana play three times, so obviously outside the Socceroos they’re my favourite team in Brazil right now. I just hope I wake up in time to let them know. ← NEVER MIND THE DRAMA – LOOK AT THE NEW SHOPS!